Christmas in LA is always a funny time of year! Although it has been a bit chilly at night, the temperature during the day is still inching into the upper 70's F. The weather isn't throwing me off too much this year, as I've been working on all sorts of fun homemade gifts and we already have our tree up and decorated. This year I've taken up knitting, thanks to my friends Whitney & Jamie for having a beautiful baby girl. I felt the need to give it a second chance. So I took lessons in a proper knitting studio, rather than on a train to Cinque Terre (where one can easily lose focus due to the stunning scenery). Thanks Whitney for trying! I've now fallen in love with it and had knitting fever for most of the summer. So of course I'm attempting knitting a handful of gifts this year. As of late, our house looks like Christmas elves have taken over. The kitchen table is a giant workstation, where stuffing stockings, wrapping gifts & I must admit a bit of magic takes place. It seems as though every other day I'm baking batches of cookies for the cookie monster that has taken over Travis' studio. As for my homemade gifts, here are some pictures of my most recent creations. 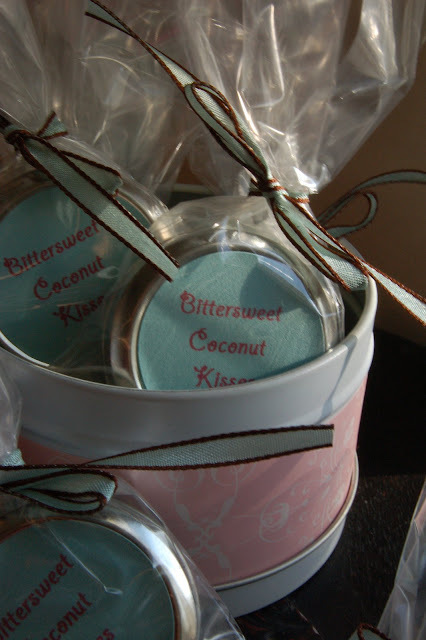 Decadent Bittersweet Coconut Kisses lipbalm. Yummy! It is of course edible, which I believe anything one wears on one's lips should be. Above you'll find one of my favorite ways to create applesauce, studded throughout with Crystallized Ginger and a traditional way to wrap up those holiday cookies!